Our Price $49.95 Another currency? For more than twenty years, readers have relied on the bestselling Prescription for Nutritional Healing as an invaluable guide to improving health through nutrition and supplementation. Now thoroughly updated, the fourth edition incorporates the most recent information on the benefits of alternative healing and preventive therapies. 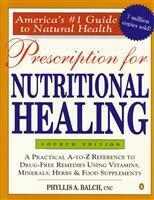 Part One lists and explains the most commonly available types of nutrients, food supplements, and herbs. Part Two describes 300 common disorders and problems, from abscesses to Zellweger Syndrome, and identifies the supplements that can be used to combat these conditions. Part Three is a guide to alternative remedies and therapies that can be used in conjunction with a nutritional program. This new edition also includes information on emerging health news. Whether you are looking for relief from a particular ailment or simply wish to maintain optimum health, Prescription for Nutritional Healing quickly and easily provides an abundance of information to design a complete nutritional program.